As tensions rise at the University of Missouri, a young photographer has unintentionally become part of the national story. Timothy Tai, a student who was reportedly shooting photos for ESPN at the school, was greeted with hostility as he approached a tent city set up on campus on Monday. The incident was caught in a six-minute video uploaded to Youtube by Mark Schierbecker. Later on Tuesday, the group appeared to have changed its stance so as to be more welcoming to media. Tai, who appeared to be growing more frustrated throughout the video, told demonstrators that the same law that protected their gathering also protected his right to shoot photos. What’s happening at the school? Racial tension is a longstanding issue at the school, and growing protests drew national attention. “I’m trying to document this for history,” Tai argued at one point. However, the person filming the incident was able to get closer to the center of the demonstration, where a woman called for “some muscle” from the crowd to help remove him. The woman has been identified as an assistant professor of mass media, Melissa Click, by the New York Times. On Tuesday, Click apologized for her actions, the New York Times reported. ‘‘I regret the language and strategies I used, and sincerely apologize to the MU campus community, and journalists at large, for my behavior, and also for the way my actions have shifted attention away from the students’ campaign for justice,’’ she said in the statement. A June 2015 post by the University of Missouri identifies Tai as a student in the school’s journalism program who has won awards and prize money for his photos. In a statement posted Tuesday afternoon, David Kurpius, dean of the Missouri School of Journalism, applauded Tai’s efforts and also sought to distance the school from Click. 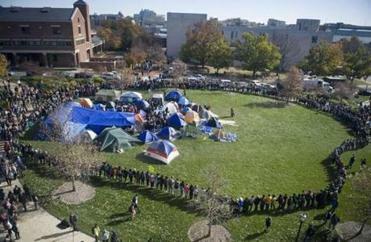 On Tuesday afternoon, the Concerned Student 1950 group tweeted that the organization is “learning and growing through this,” and retweeted a photo of a flier to campsite occupants entitled, “Teachable Moment.” The flier said that media has a right to occupy the site, and that they should be welcomed. Racial tension is a longstanding issue at the school, and growing protests drew national attention, especially as the system’s president, Tim Wolfe, resigned Monday morning amid widening protests. Columbia campus chancellor R. Bowen Loftin also said he would relinquish his post.